In this post we are going to be discussing what Pinterest group boards actually are, why they are awesome for getting your content out there and how to join them. 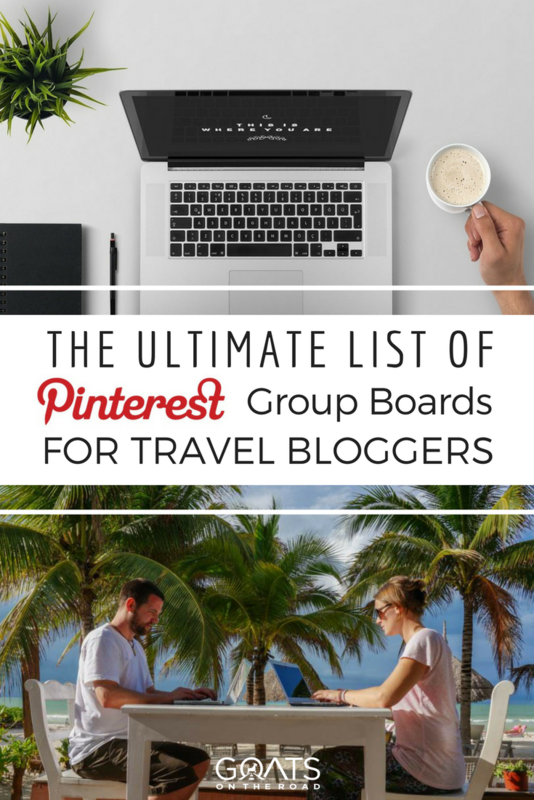 Oh, and we’re also sharing our top 50 Pinterest Group Boards for Travel Bloggers so you can just click-through the links and get joining! A group board works like any regular Pinterest board, the only difference being that multiple people can pin content to it. The person who created the board owns it and they can add others to join. To identify whether a board is a personal board or a group board simply look at the board icon, if multiple profiles are present it’s a group board – simple! Also, just to clear up any confusion, Pinterest group boards sometimes go by other names. So if you hear the terms; shared boards, contributor boards, collaborative boards or community boards don’t worry, they are all the same thing. What’s The Advantage of Pinterest Group Boards? The major benefit of Pinterest group boards is that the content you pin will reach a far wider audience than just your followers. This is because it is also reaches all the other contributor’s followers as well. The more eyes on your pins, the more chance you’ll have of re-pins and click throughs to your website, hence increasing your traffic. 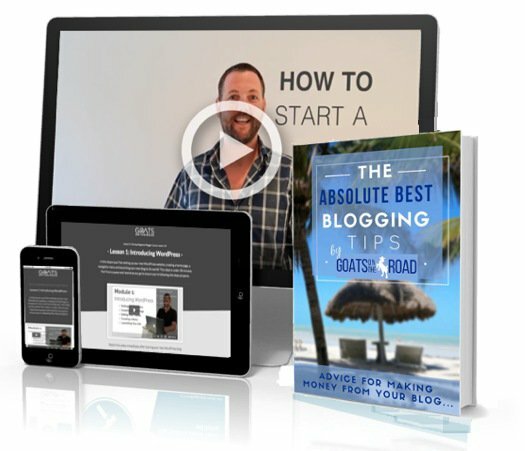 Want to learn How To Start a Travel Blog? 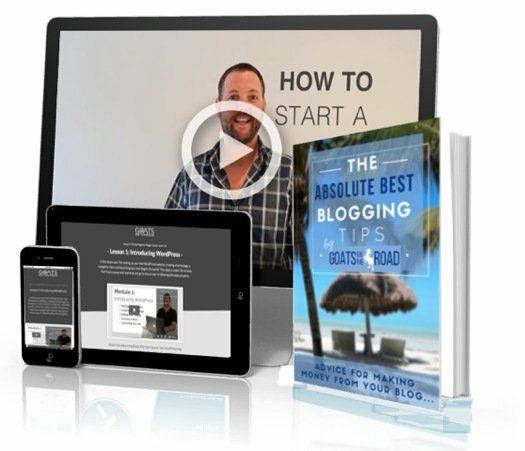 We can show you how in just a few minutes and to get you started, we’ll send you our 4-Part Beginner Blogger Video Course & our 200-page blogging ebook for free! Click Here to learn more. 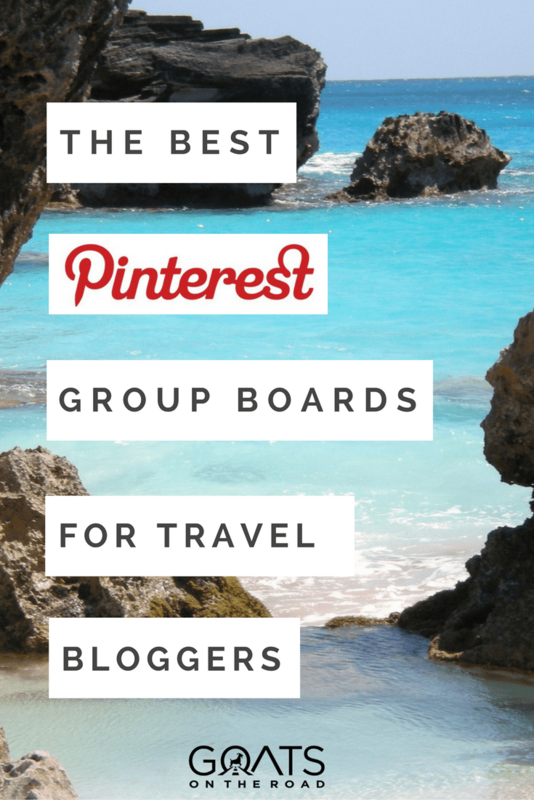 Because group boards are generally curated around a specific niche and the content is monitored by the owner and irrelevant and/or unattractive pins removed, they are excellent resources for repinning other people’s quality content to your other boards. From a business perspective, creating your own group boards also creates excellent networking opportunities and if you have a particular niche board will build up your authority as as a thought leader on a particular subject. 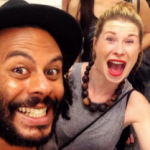 For example the main focus of GoatsOnTheRoad’s blog is to enable people to earn money on the road and live a life of fulltime travel. Therefore, their Pinterest group board ‘Turn Travel Into A Lifestyle’ is all about that.  Pro Tip: If you want to have great, professional-looking photos for your Pinterest images and on your blog, consider signing up for Shutterstock. They have lots of amazing stock images available for creators. Depending on the settings of the individual group board, you will either need to secure an invite from the owner or one of the other contributors. When you are in the board, the board owner will always be the most left profile picture. Each group board will usually have joining instructions in the board description, which will typically be things like follow the owner profile and direct message them through Pinterest or sometimes an email will be provided instead. If there are no instructions the owner is probably not looking for contributors at that time but if you really want to join there is no harm in sending them a quick message. 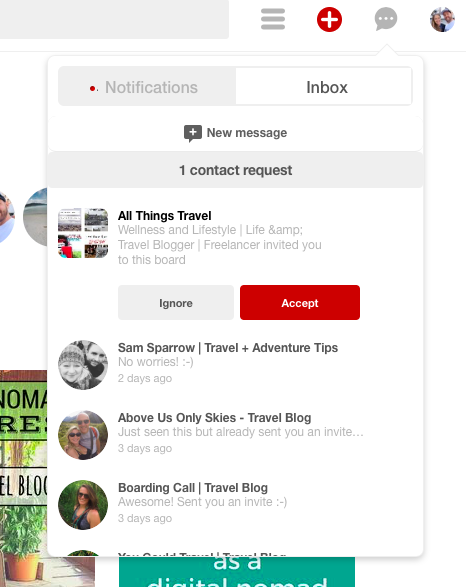 To send a direct message in Pinterest click on the icon with 3 dots on your Pinterest toolbar and go into your inbox. This is where your invites to group boards will also come in. Once you accept the invite, it will be added to your profile along with all your other boards. Could we please be added to your ________________ Pinterest group board? Always read the group board rules before you request to join and follow them once you are a member, as you risk being removed from the group board if you pin irrelevant content, or too many pins at once, for example. There is an awesome tool called pingroupie.com which has a clickable list of group boards that you can filter by niche. 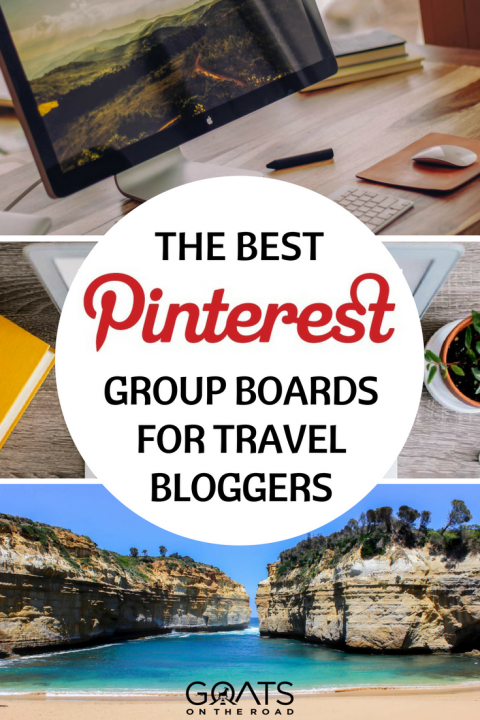 However, to save you even doing that while you are just getting started on Pinterest, here is a list of our top 50 favourite Pinterest group boards for travel bloggers. World Places To Stay Wow! Compared with our other social media referrals, the proportion of website traffic we get from Pinterest is by far the biggest at nearly 70%. If you’re wanting to make a success of your travel blog you really can’t afford to be ignoring this social platform. So, get joining these group boards! Let us know in the comments if you find any other favourite Pinterest group boards. This is a very interesting blog since it’s a very creative and amazing way to gain visibility for a website and increase the reach of your blog, thank you for these incredible tips and for sharing different group boards! Thanks so much for mentioning Mappin Monday!! And a great overview of other groups, super handy! Great info on Pinterest, but gotta share a pet peeve: too many bloggers post images with their post title obscuring whatever they are sharing. Absolutely loved reading this post! Pinterest is such a great social media platform for bringing in views to your blog! I’ve been stuck lately trying to find good travel boards to join on Pinterest. Thanks so much for this! Following you on Pinterest too. You guys are awesome! Great! Glad you found the list useful Happy Pinning! I’ve noticed though that over the last year it’s harder to get traction, so many more bloggers also using Pinterest. And like anything else it’s usually a couple of pins that bring in 90% of the traffic. Most of these boards I’ve never heard of. I’ve had it in mind to rededicate to Pinterest so I’m going to start with these right now!